The demonization of Israeli “settlers” – those Israelis who live beyond the “Green Line” – is a narrative that is simply reflexive in much of the mainstream media. The Guardian represents an especially egregious case of employing such caricatures to describe Israelis who live outside of the 1949 borders. My tour of the settlement of Eli was an attempt to understand the settler movement and, more importantly, to understand what motivates Israelis to move to communities in Judea and Samaria. Here is my snapshot of the community. I recently toured the settlement of Eli, a few miles from Ariel, a community stretching over a vast area situated on a mountainous topography, including a cluster of neighborhoods with a total of 3,000 residents. The center of life in Eli is the pre-military academy that attracts religious students from all over the country. Maj. Ro’i Klein, an Eli resident and hero of the Second Lebanon War, was killed when he leapt on a grenade to save his fellow soldiers. Quality of life is not a vague concept at Eli. There are cultivated gardens, breath-taking mountain views, the shades of its olive trees, and a well-kept regional sports center, which includes multi-purpose playing fields, a tennis court, a work-out facility & swimming pool. Eli provides health services, a small shopping center, and post office. Synagogues and ritual baths are scattered around the neighborhoods. Eli is also only 30 minutes from Jerusalem. And, the relatively short distance from Israel’s large centers of employment, particularly the Industrial Parks in Barkan and Ariel, allow direct access to and from work. 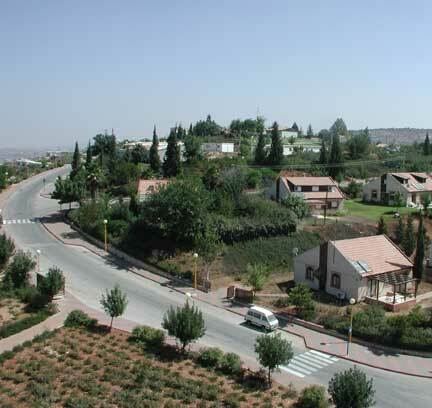 The town is at an elevation of about 700-800 m. above sea level, with a climate similar to that of Jerusalem. Kobi Eliraz, who is the head of Eli’s local council, spoke to our group with an immense sense of pride about his community. Eliraz is disappointed by most Israelis’ refusal to cross “the eastern threshold of Ariel,” after which the real “settlements” begin. He wanted to also make it clear that he recognizes the authority of the state, and if it wants to evacuate him from Eli, he says, he’ll fight the decision – but peacefully go along with it. Indeed, that sentiment was echoed by others we spoke to. One of the more interesting things I discovered was that the population of Eli includes a significant number of secular Israelis – inconsistent with the caricature of the settlers as uniformly religious. While I obviously wasn’t able to speak with a large number of residents here, my sense from speaking to the community leaders is that Israelis are drawn to such settlements for a number of reasons. The beauty of the area and relative affordability of home ownership is a factor for some; the allure of living in close-knit, family friendly community is also a draw, as well as the feeling, which I heard echoed by Eli residents – as well as the residents of a tiny outpost near the Jordan Valley that I visited later in the day – that a pioneer spirit was partly at play. I couldn’t help but think of the American families moving to remote unsettled areas of the Western frontier, in the 19th century, as the borders of their nation gradually expanded – drawn by cheap land, and the promise of a fresh start. No doubt such pioneers thought they were entitled to do so either by political right or by providence. Likewise, Israelis who have opted for these remote hillside communities are also driven by perhaps a sense that, as the original Jewish homeland in Eretz Israel included areas in what we call today the West Bank (Judea and Samaria), they too have an inherent right to settle the areas. But, as the West Bank was captured by Israel in a defensive war (The Six Day War), and not, as in the American example, in the context of expansionist conquest, they no doubt also feel – I think justly so – that they have a strong moral and political claim to the land. I’m very sympathetic to the settlement community, and am saddened by the degree to which they are often demonized (even by Israelis and Jewish supporters in the diaspora). And, I further feel that Israel’s reluctance to cede more land to the Palestinians, after their experience in Gaza, is completely justified. However, I also feel that, for the sake of a TRUE and LASTING peace, evacuating such settlements may eventually be the the only responsible option. The devil, of course, is in the details. I’ve argued before, and still believe (based on polling data), that Palestinians are not yet ready to live with a Jewish state within any borders – so, ceding land would not, in the current political context, do anything to advance peace. However, if that day ever comes when Palestinians are truly ready to live in peace with Israel, I think I represent the feelings of many Israelis who think that enormous sacrifices may indeed be worth it if the outcome is a true and lasting peace. It still wouldn’t be a fair or just outcome for the Israelis who have built homes and communities, and raised families here. But, as politics is rarely about perfect justice – merely about making decisions based on what will cause the least harm – if the decision is between holding onto such settlements at any cost, versus ceding land in return for a genuine peace, I think the choice is a clear one. When it comes to the “settlements”, the axiom that “the perfect is the enemy of the good” has never been more relevant. Adam – I think that one thing you may have noticed was that despite all the claims about the area of the WB occupied by settlements, in reality it is a very small percentage, which is why Israel can readily offer 95 percent or so to the Palestinians for their future state. Places like Eli could be evacuated though in fact the effect would be psychological more than physical in terms of real estate freed up. These villages, which except for Ariel is what they are, cover a very small area in fact, and most if not all are built where there have been no agricultural activity at all – just rocky ground. (I do not consider Ma’ale Adumim, French Hill etc. and the rest around Jerusalem which is where the majority of “settlers” live to be “settlements” – they are part and parcel of Jerusalem). Ironically, just as in the 1800’s and early 1900’s, the Arabs would benefit by leaving Jewish settlements like Eli in place to create local jobs and raise the standard of living, but I do not expect that they will make that leap of faithor reason in time to help themselves. The caravan nuts of course represent in area something less than a fractional percentage of the WB’s area and it is really just a police action to get them out and put an end to their trouble-making. Can someone please explain what this great travel guide to Eli has to do with your banner statement “Monitoring and exposing antisemitism on the Guardian newspaper’s ‘Comment is Free’ blog. Over the past weeks you apppear to be changing direction and watering down your effectiveness. I find that very irrelevant and somewhat patronising. The Palestinians will inevitably make their own economic decisions and Israel will have to accommodate them, based on negotiations and agreements. An obvious conclusion is that being adjacent to a large, wealthy market such as Israel is sufficient “to create local jobs and raise the standard of living” for the Palestinians, even if the settlements are not in place. This is also a misleading statement, particularly if you remember he first Bibi regime from 96-99 and his negotiations with the PA regarding further withdrawals prior to the final agreement (the “pe’imot”). Bibi couldn’t find any area to withdraw from because each settlement required area to expand, a large security perimeter around the settlement, an access road, a security perimeter along the access road, etc, etc. As I stated in my intro to the piece, and as I made clear in other posts, the demonization of Israeli settlers is so common at CiF (btl and atl) as to become a banality. As an effective blog doesn’t just respond to misinformation but, rather, proactively offers alternative views to, hopefully, enlighten some folks – who only get their info from the MSM – about the true nature of Israel., Settlers are not, as I’ve argued elsewhere, the biggest impediment to peace, and certainly aren’t the malicious zealots they are portrayed to be. Adam: This site until a short while back was producing good comment and counter balance to the anti sprouters, particularly the blatant ommissions and untruths included in CiF. You posting, in the majority, are diluting the good work that was being done by the other contributors on the site, particularly in the volume of unrelated posts you are making. Contrary to your claim, as related to this blog, this travel guide can be used to prove exactly the opposite – my reading of your post strongly indicates that you support the views expressed in CiF. Are you truly still going to claim that my positions are CiF positions. The value of posts such as these is a matter in which reasonable people can disagree, but to call me a CiFer is simply not a serious claim. Personally I agree with little of what the man says – but this perspective (and that of other settlers) needs to be heard. Writing off the settlers as some homogenous bunch of violent extremists is both silly and counter-productive. the Arabs would benefit by leaving Jewish settlements like Eli in place to create local jobs and raise the standard of living, but I do not expect that they will make that leap of faithor reason in time to help themselves. And this website is supposed to be challenging prejudice and intolerance? Pretzelberg. Your 2.45pm post is incomprehensible. Are you trying to say that the AKUS post and Adam Levick’s approval of it is prejudiced or intolerant? The post suggests that Israeli settlement over the green line gives jobs to local Arabs. Explain the prejudice and intolerance in that suggestion if you can. pretzel – you need to read a bit more widely, apparently. Even the 1934 Peel commission, biased against the Jews, had to point out that the Arabs benefited greatly from Jewish towns and villages, and clustered around them because the opportunity for work and an improved standard of living made it better for them to to have Jewish settlements in Mandatory Palestine. Moreover, the news spread, leading to an influx of approximately 600,000 Arabs during the Mandatory period from other areas in the ME because they could better themselves where there were Jewish settlements and industries. In the same way, Arabs on the WB would benefit from retaining Jewish settlements (leaving aside the issue of why, if Arabs can live in Israel, why can’t Jews live in a future Arab country). Sometime you need to get beyond your kneejerk PC view of the world and face reality. I find that really amusing in the context of some of the statements you made in this thread. Telling the Palestinians what is good for them is a tired “kneejerk” attitude towards the conflict. Think about it – many of the people we criticize here do exactly the same – telling Israel what its best interests are. More listening and less preaching (on both sides) is definitely needed ! The issue that has been raised here is entirely an economic one, and Levick’s comment seems a lame excuse to justify leaving the settlements in place. As I said before, the Palestinian economy will succeed if it is granted easy access to the adjacent wealthy Israeli markets. A few bedroom communities with several hundred commuting families will have exactly ZERO influence. MTC, what a bunch of balderdash. 1. The settlements have a population well over 400k and could be a significant source of Palestinian income were there not a security problem. As it is, PA calls for boycotts cut off the Palestinians’ own noses to spite their faces. 2. As you should well know, prior to the intifada the Palestinians did have access to Israeli markets and flourished. 3. The end to that commerce was the PA’s doing, for it was indeed the PA which ordered the second intifada. Nose, face, etc. 4. Now that Israel has replaced the Palestinian labour with peaceful immigrants, it is not about to go backwards. Palestinians, nose, face, etc. 1. I agree, but you miss the point: The Palestinian economy will thrive because of its position adjacent to a wealthy market of 7 million and its ability to provide goods,services and manpower to Israeli industry. Small bedroom settlements like Eli are irrelevant to the Palestinian macro-economy. 2. I agree – but this has nothing to do with the settlements. 3. I agree – but this has nothing to do with the settlements. 4. I agree – but this has nothing to do with the settlements. I’ve just seen Condoleeza Rice saying that Abbas “wants peace through negotiation”. Is she also part of the global pro-Palestinian conspiracy? Small bedroom settlements like Eli are irrelevant to the Palestinian macro-economy. Big mistake. My place is in a settlement size bedroom community and during its ten years of existence it gave a huge boost to the standard of living of the population living in its vicinity, it radically changed their lives, social and economic situation positively. Anyway I think that this question is not relevant, for our and the next generation the economic advantages or disadvantages of any arrangement are unimportant, and you are correct to say that without leaving the settlements there will be no peace. Sadly as things are today the prospects for achieving peace are nil, even if Israel would evacuate all of the WB – a political and economical impossibility. I agree that there is a small local effect, but in global terms of the total Palestinian economy the effect is miniscule. I assume that a factory located in the WB that currently employs local Palestinian labour would continue to do so if a peace agreement were signed, whether or not the factory is relocated to Kfar Saba or it remain within the boundaries of a Palestinian State, whether or not settlements are removed. The economic boom generated by true peace would more than offset any local loss. I return to my original contention that it is useless to tell the Palestinians what is good for them. It is their right to decide to pay the economic price for removal of the settlements, within the context of a peace agreement. Adam Levik cannot convince them that it is in their interests to keep the settlements any more than he could have convinced the Slovaks to stay part of Czechoslovakia or the Irish to remain part of GB. Peace will be achieved when both sides start listening to and respecting what is important to the other side. Because Abbas says it doesn’t mean to say he means it. As I said at the moment the economic advantages or disadvantages respectfully or disrespectfully advised by any side of the concflict has no relevance. Adam doesn’t have to say the Palestinians that the will heve serious economic losses as they know it very well based on their Gaza experience. I guess they would do after a doubtful future settlement evacuation on the WB exactly the same what they did in 2005 there. Would this be the same Condi Rice the left insists the incompetent tool of the incompetent Bush in matters of Mideast policy? You are assuming that a WB evacuation would be from “hostile” territory, like Gaza. But I think we are discussing a withdrawal within the framework of a peace agreement, which implies a friendly settlement. We can assume that this would include economic agreements which would facilitate mutual access to the others market. We all know that any real peace agreement would generate an economic boom in the region, similar to what happened after Oslo. The benefits from the boom and the reopening of the Israeli market to the Palestinian economy would greatly outweigh the loss caused by the removal of bedroom settlements. We all know that any real peace agreement would generate an economic boom in the region, similar to what happened after Oslo. After Oslo there was really a huge economic progress on the WB but not much later there was an other development too – the start of the second intifada bringing death and destruction. Why do you think that it won’t be repeated? I’m afraid you are going around in circles here. You are the one who mentioned the “Gaza experience”. I’m sure that Adam Levick wasn’t referring to that scenario when he said ” if the decision is between holding onto such settlements at any cost, versus ceding land in return for a genuine peace, I think the choice is a clear one. ” The discussion developed around AKUS’ comment – “In the same way, Arabs on the WB would benefit from retaining Jewish settlements”, but was also clearly referring to a situation under a “genuine peace”. So the only one who is talking about the “Gaza experience” is you. Bad argument. Note, not a wrong argument (factually), a bad argument. Bad, because it makes the Jewish presence in the Land of Israel out to be like the “White Man’s Burden” of old: a mission of civilizing the savages through economic, cultural etc. benefits for them. The Arabs would benefit (as I said, the argument isn’t factually wrong), but it’s ignorant of human nature to think they’d trade their national pride for such benefits. It’s the same mistake America did with its “nation-building” misadventures in Iraq and Afghanistan. It’s about the basic difference between humans and dogs: Feed a dog and it’ll love you, feed a human and he or she will hate you. You lose by calling them settlers; to portray them as being of benefit to the Arabs is just an attempt to salvage a moral justification out of that wreckage. Me, the only settlers in my eyes are the Arab settlers, while the Jews are the indigenous Palestinians. With that formula, I have no need for trying to justify Jewish inhabitation anywhere in the Land of Israel. First step to winning is not to adopt the enemy’s terminology. ziontruth – its not an argument. The fact that they will not face it is to their detriment. MTC is of course also correct that simply being alongside a local powerhouse like Israel will help them, just as Canada benefits from proximity to the USA, but they would benefit even more, as so many countries have done, with a little Jewish yeast mixed in with the dough. Gotcha, AKUS. I just thought so because there are a lot of pro-Israel writers who do use that as an argument. If you really are talking about “a friendly settlement” with mutual access, etc., then why do you assume they would need to kick the Jews out of their homes? If the Palestinians were actually interested in “a friendly settlement” they could tolerate a small number of Jews in their country just like the Jews tolerate and give equal rights to the Arabs, Druze, Christians, etc in Israel. To say that a future Palestinian state must be Jew-free, but Israel must tolerate and give equal rights either means 1. you have a very low opinion of the Palestinians and their capacity for tolerance or 2. you have a low opinion of Jews. I’m sorry that you are unable to follow to follow a simple argument. The issue being discussed is entirely economic , i.e. the economic benefit to the Palestinians from leaving settlements in place in the framework of a comprehensive peace agreement. My opinion is that these bedroom communities would provide almost no benefit. I never said a future Palestinian state must be”Jew-free”. The legal mind must ask: Since there is no such thing in law or history as a right by ancient tenure to expel those who have inhabited the land for 1300+ years, how can anyone not be repelled by the willingness of settlers to kill and steal the Palestinians’ land? Also, what validity to acts by Britain and the UN (thanks to Harry Truman arm twisting) have to give away Palestinian land? Those who respect international law (It is established by treaties. It is not the imagination of dreamers) must ask, since the UN Treaty of 1945 to which Israel is signatory, prohibits acquisition of land by conquest, what right to Jews have to the land? The believer of the Hebrew Bible must ask: Since Jeremiah 31 says that the Jews broke the covenant and a new covenant would be made, how can anyone think the Jews have a right to kill or expel the Palestinians from their land? The Christian must ask: Since the New Testament teaches that Jesus is the fulfillment of the New Covenant and it is the Believers who are the heirs of Abraham, why should any Christian approve of expulsion of Palestinians from their land? Those who are of other faiths must ask: What is wrong with these people who are willing to kill and rob Palestinians? Edhu Barak said the threat of Iran is that it will be difficult to retain Israel’s most productive citizens. The American Taxpayer must ask: Why should I go to war against Iran to protect Israel from Brain Drain? The American Taxpayer must ask: Why are the Israelis hands in my pocket? This Israeli tyranny on Palestinians is destructive to America. Livia Rokach has revealed that the diaries of Moshe Sharrett report that the Zionists adopted a strategy of provocation the create a pretext for massive strikes against the Palestinians and neighboring Arab states. It says that Israel had to “invent” dangers. The world has a compelling interest to see reconciliation between Jews and Palestinians. But, this demands that Israel abandon aggressive ambitions and vacate the West Bank and admit wrong doing. Such confession releases the Palestinians to give forgiveness. Germany confessed and France forgave. Reconciliation will dissolve antagonism toward Israel like repression never can. Does Israel have legitimacy? Not at all, but it can gain legitimacy by a just peace with Palestine. Legitimacy is available from the Palestinians. I am deeply thankful for the Righteous Jewish Americans and the Rigteous Jewish people of other nations who are repelled by Israeli tyranny and see clearly that Israel pursues a self destructive path. You seem to be upset that the Israelis are not the unarmed Jews of WW2 nazi AKA national Socialist filth infested Europe.